Chǎo lìzi (Chinese: 炒栗子) can be found churning in large cauldrons on the street emitting sweet, nutty flavors into the air. 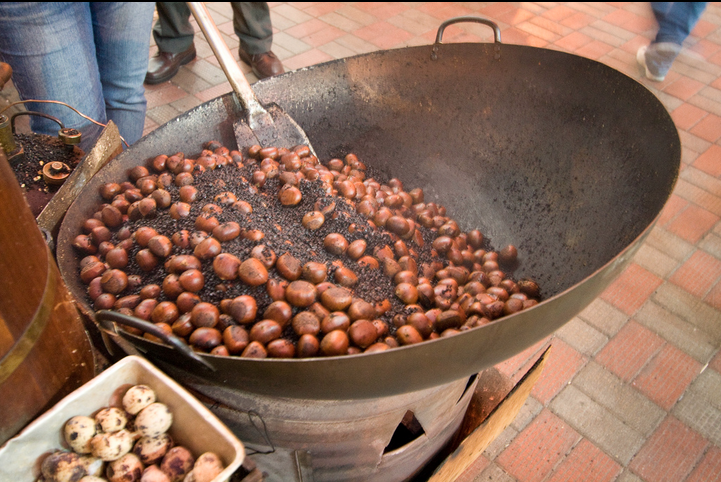 Chestnuts are roasted and seasoned with coarse sand, syrup and osmanthus essence. Once they’ve been evenly roasted, the sugary chestnuts appear glossy. The shells should fall away easily–an indication of the quality of the chestnuts–revealing the “meat” which should be golden, soft and tasty. They are best eaten immediately after they have been taken from the wok. Once cooled, they are no longer as sweet or fragrant. Sugar-roasted chestnuts from the Xin Chang Fa Food Store chain are regarded as the best in Shanghai. This street food treat is popularly eaten among locals during the colder months of the year, usually selling for 16 yuan to 32 yuan per kilo. According to traditional Chinese medicine, chestnuts are regarded as “fruit for the kitney and patients with renal diseases.” It is a warming food that is said to nourish the qi of the gastrointestinal system, spleen and kidneys. Chestnuts are also used to improve circulation, and are eaten daily by elderly Chinese people to prevent and treat high blood pressure, heart disease, hardening of the arteries and osteoporosis. They are especially eaten during the autumn and winter because their high carbohydrate content provides a warming quality that is good for suppressing and combating colds. Chestnuts are soaked in rock sugar, molasses, and water. They are then fried in oil until golden. Chestnuts are first boiled until tender. Sugar and molasses are boiled before the chestnuts are added and cooked at a simmer until all of the liquid is absorbed. The chestnuts are drained and then added to an oiled cauldron. They are churned by a rotating shovel inside the heated cauldron filled with coarse sand. The purpose of the sand is to heat them evenly and retain their inherent sweetness. Chestnuts have been apart of Chinese cuisine since neolithic times. Remains of a chestnut species named Castanea vulgaris, have been found earlier than the Han Dynasty. Chestnuts were one of the many food items found in tombs in Hubei. Chestnut trees were indigenous in the Hubei Province as well as other northern, western, and some southern areas too. Traces of its existence in such an exceptionally early part of China’s food culture proves that it is one of the earliest nuts used in antiquity. They were given to emperors as tribute, using them as gifts for his noble lords. Their trees were considered a good omen, so they were often planted near court mansions or alters at temples dedicated to earthly spirits. In ancient times, chestnuts were stored sun-dried and sand-covered under a pottery dome.